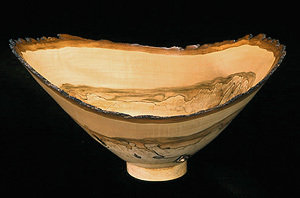 "Nested" bowls comprise a series of bowls turned from the same piece of wood - the smaller bowl will sit inside of the larger bowl, and usually carry the same markings and grain patterns. 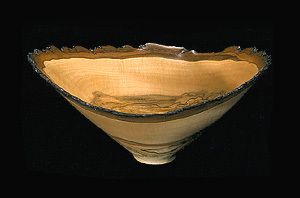 Special cutting tools were employed to save the interior material so that another bowl could be turned. This is an exceptionally technically difficult task to execute when making "natural-edge" bowls and is not something attempted by most wood turners. 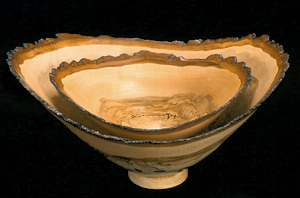 The fact that the beautiful natural bark on the edge was able to be retained intact on these pieces makes this set even more valuable (a third and smaller bowl had to be discarded in the early stages by attempting this process). Wood connoisseurs who see my work for the first time always ask, were do I get my wood? The truth is that I'm blessed with some very good friends and others who appreciate what art I can sometimes make of what might otherwise become firewood - and who also know of my appreciation for things unusual (and other oddities of Mother Nature) in tree form. Some collectors of my work living in Ohio needed to remove a tree due to old age and decay. A day of very hard work in removing this tree resulted in a small pick-up truckload of finely selected spalted Red Maple. The very best of the lot was selected especially for this bowl set. As referenced below, I am willing to sell each of the bowls separately, though I would much prefer to see them appreciated as the nested set, as I truly have few chances to offer such exquisite sets for sale on this website.